The stories of Greek mythology have entertained people for thousands of years, and even today, the surviving stories have ensured that the names of many figures are still well known. Zeus is normally taken to be the supreme god of the Greek pantheon, but the surviving tales tend not to focus on the rule of Zeus, but rather, they focus on the love life of the god. Zeus was married to Hera, his third immortal wife, but despite being married, Zeus would have many relationships with mortals and immortals, bringing forth a plethora of offspring. One such relationship was that of Zeus and Leda, a relationship that also produced children for the supreme god. The story of Leda and Zeus is one talked about in virtually all complete surviving texts from antiquity, with the likes of Homer (Iliad and the Odyssey), Apollodorus (Bibliotheca), Pausanias (Description of Greece), Hyginus (Fabulae and Astronomica), Virgil (Aeneid) and Ovid (Metamorphoses), all mentioning the relationship. where the story is referred to as Leda and the Swan, but the story from Ancient Greece is only really important because of the offspring produced from the relationship. ​Leda was a daughter of Thestios, the King of Pleuron; Thestios being famous as the uncle of Meleager in the story of the Calydonian Hunt. When of age, Leda was married to King Tyndareus of Sparta; Tyndareus having been placed on the throne by Heracles. Leda was a beautiful woman, and her beauty attracted the attention of Zeus, who spied her from his throne on Mount Olympus. 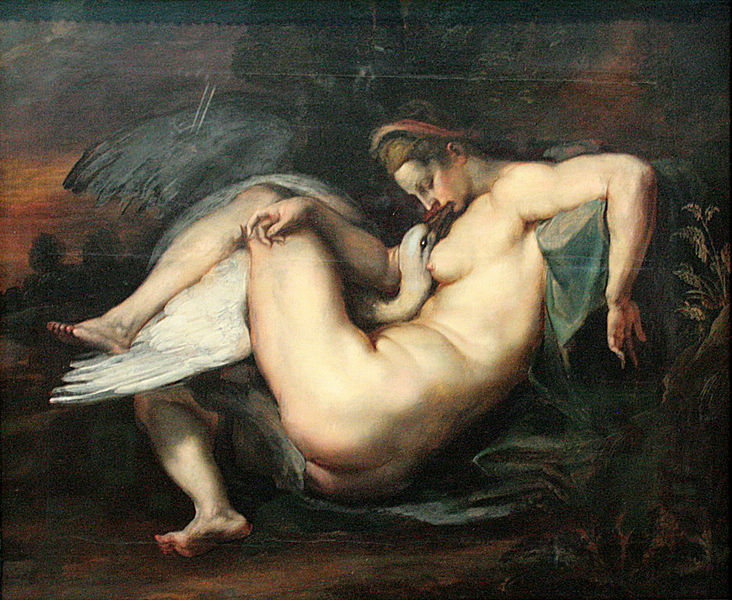 The beauty of Leda roused Zeus to action, and the god transformed himself into a magnificent swan. Then, portraying himself as a bird escaping from a bird of prey, Zeus lay down next to Leda, and impregnated her. On the same day, Leda would also sleep with her husband. 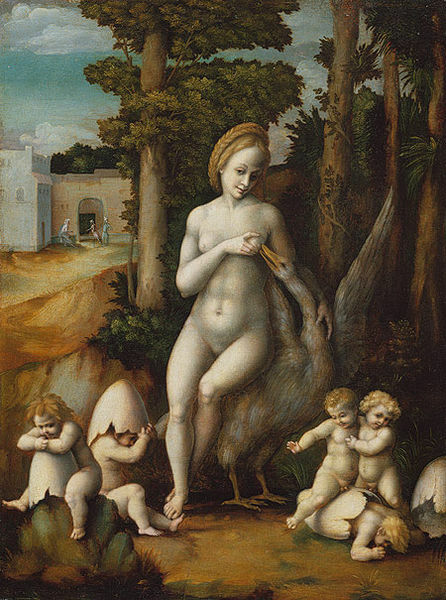 Leda would subsequently produce one or two eggs, from which four offspring were born; the children being Helen, Clytemnestra, Castor and Pollux. It was generally considered that Helen and Pollux were children of Zeus and Leda, whilst Clytemnestra and Castor, were the offspring of Tyndareus and Leda; although this view was by no means universal in antiquity. A lesser known version of the myth sees the eggs being laid by the goddess Nemesis, after a relationship with Zeus, and the Spartan Queen simply looking after them until they hatched. Helen is arguably the most famous of the four children of Leda, although the use of the epitaph “of Troy” is probably needed for clarification. In adulthood, Helen was known as being the most beautiful of all mortals, a fact which would see her abducted by Paris whilst married to Menelaus. This abduction would see the Greeks and Trojans go to war. This abduction of the daughter of Zeus and Leda, was only the second that Helen had experienced, for as a child, Helen was abducted by Theseus, resulting in a war between Sparta and Athens. Castor and Pollux were twins who were considered inseparable, and the pair were highly regarded heroes in Greek mythology. When young, the twins would lead the Spartan army against Athens, to retrieve the abducted Helen. Then later in life they would be counted as members of the Argonauts, on the quest for the Golden Fleece, and would also be amongst the hunters of the Calydonian Boar. Pollox was immortal, whilst Castor was mortal, and when Castor was killed, Pastor would give up his immortality, so they pair could be placed for eternity in the heavens, as the constellation Gemini. Clytemnestra, whilst less well known, would also play an important role during and after the Trojan War. Clytemnestra was married to King Agamemnon of Mycenae, the most powerful king of the day; this meant she was sister-in-law to Helen as well as sister. Clytemnestra would sometimes be depicted as the wronged woman, and sometimes as the murderous wife. Before the Trojan War started Agamemnon would sacrifice their daughter, Iphigenia to the gods, to allow the fleet to sail from Aulis; and during the war, Clytemnestra would start an affair with Aegisthus. These two points would lead to Clytemnestra killing Agamemnon on his return from Troy; whilst she herself would subsequently be killed by Orestes, her son, because of the murder. The importance of Leda in Greek mythology ends after she has given birth to the children of Zeus, and there is relatively little mention of the queen afterwards; although the story of her husband continues for many years afterwards. The story of Leda and Zeus is interesting though, as Leda managed to escape Hera's wrath, and even the illegitimate children of Zeus were not punished by the goddess, unlike so many of Zeus' lovers and children. The basic imagery of the Greek myth, that of Leda and the Swan, has endured for many years though, and there have been many good painting produced on the subject.